Topic: How do they make huge naan breads? Some BIRs produce naan breads which must be at least 6 times the normal size. Do they somehow manage to squeeze them into a tandoor oven are are they cooked flat in some kind of large oven? Re: How do they make huge naan breads? Hi George, they look about the size of a standard nan here in Glasgow. About 12 -15inch at most , folded in half and shoved in a bag for takeaway. Would go in a large tandoor no problem. I've only ever seen smaller when its been cut up for buffets or part of a lunchtime or voucher deal. That said , there's always loads going to waste on tables. 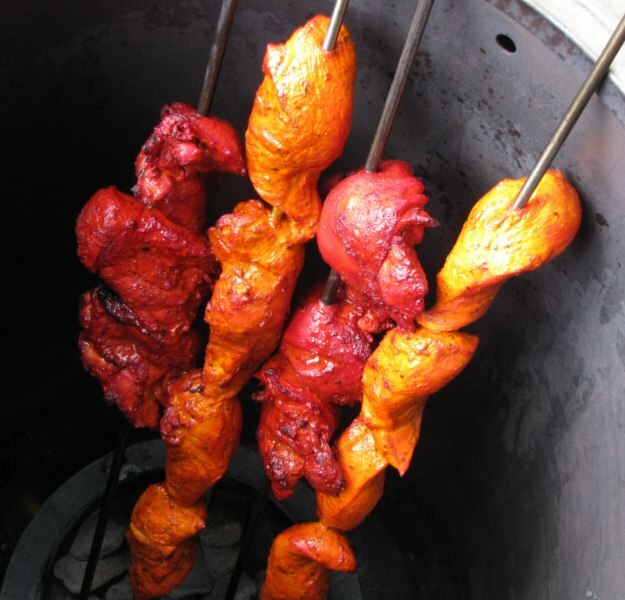 The huge naans are cooked in large steel lined tandoors which have a top opening getting on for 30 inches wide. The naans themselves are rolled and placed on a gaddi that is more akin to a bed pillow. This is what I have seen in a :Balti: house. I've no longer got other photos but you can see the straight sides and wide opening of the large naan tandoor on the right. there is about 2 inches of insulation then the inner steel lining.